Wikipedia defines green living as “a lifestyle that attempts to reduce an individual's or society's use of the Earth's natural resources and his/her own resources”. 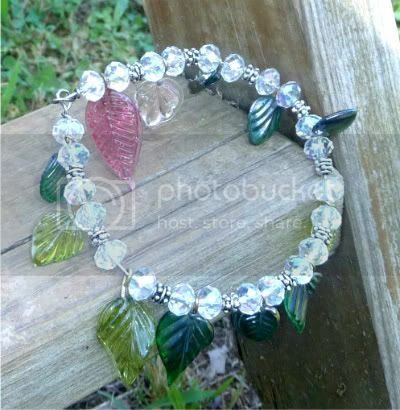 And what could be more green than using old jewelry to make something new? Repurposed jewelry is not only trendy, but unique and fascinating as well. Each piece has a story and a history, combined with the designer’s individual style. At Mylana, vintage beads and components get a new life in charming and colorful jewelry designs. The artist, Clare, is a seeker of unique and rare beads for one-of-a-kind jewelry. She’s also a talented soaper and chandler, or candle-maker. Inspirational Beading: What is your all-time favorite bead? Clare: My favorite beads are ones that I have salvaged from vintage or broken pieces because I feel as if I am giving them new life in a different design, and you can find a lot of interesting and unique pieces. 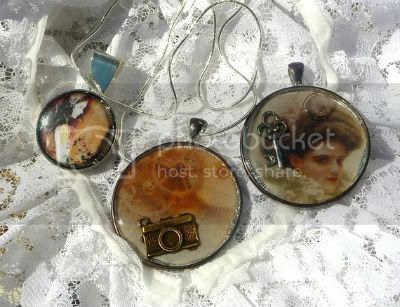 I also like working with resin, and making collages in resin filled bezels. 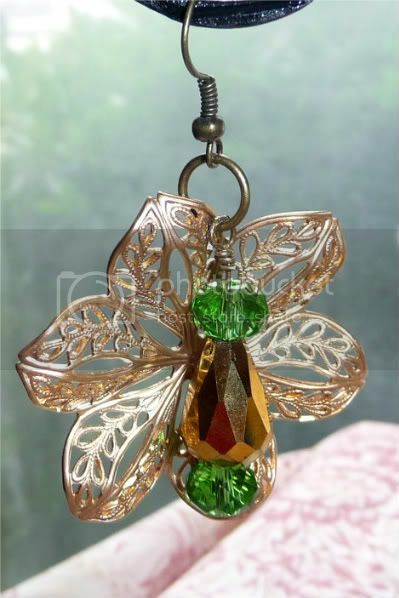 Often, I like to browse bead shops and online stores for glass and gemstone beads, but they are not affordable for me right now, as jewelry making is a secondary hobby. I lust after blue chalcedony briolettes and green chrysoprase faceted beads. Clare: First and foremost for crafting, I make candles and soap. I just learned how to make jewelry last summer by taking apart and reassembling old and broken pieces. I like to decorate my candles with beads and embellishments. Additionally, I love to clean up big, beautiful vintage beads and pendants and turn them into cocktail rings. Vintage lucite beads make really nice earrings because they are so lightweight. 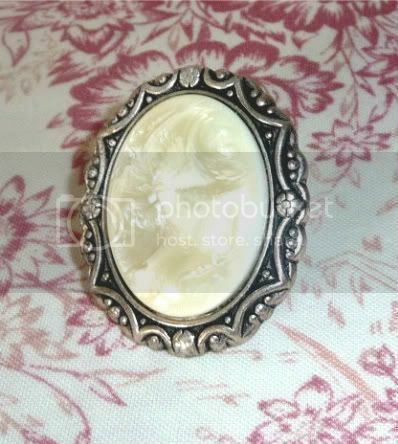 Clare: Here is a ring I made by disassembling a vintage necklace and cleaning up the focal: White Vintage Cabochon Ring. It was very dirty and needed a lot of cleaning. I enjoy big, bold rings, and this one certainly gets noticed. Clare: Mix things up with newer and trendier components, like vintage inspired findings, charms, and chains, to get a more modern edge. I like to look in bead magazines and craft shops for what seems to be trendy and try and incorporate some of those materials into my piece if I can. Being able to afford new pieces and supplies is a problem, so I look in thrift stores, estate sales, and on Etsy for new and vintage supplies. Owls, brass keys, birdcages, and enameled flowers are hot right now. Inspirational Beading: What is your favorite bead or material to pair these with? Clare: For rings, I like to make really big statement rings that are simple, and I usually use the vintage inspired ring blanks. For making other items, I love the look of keys and brass stampings and filigree. Inspirational Beading: If you were stranded on the moon, and you could have only one kind of bead with you, would you choose these? Clare: Vintage beads really is too big of a category, so to narrow it down, I would have to say vintage lucite beads. They are sometimes as pretty as glass without the weight, so you can make bold earrings and necklaces that are like wearing a feather. Inspirational Beading: In your opinion, what is the best source for these beads? Clare: Because I sell on Etsy, I like to shop there too, and I see a lot of amazing beads for good prices, being sold in destash lots. I also like estate sales and eBay; however, with eBay, I have found that there is more junk in the craft lots, and estate sales are too expensive. Some of Clare’s favorite supplies shops include Yummy Treasures (also on ArtFire) and Bunny Sundries. You can see more of her unique designs in her Etsy shop, and get the latest news on jewelry, candles and soaps on Facebook. I love how she uses so many leaves in her designs! Thanks for featuring my creations! Great blog. Oh her creations are awesome and I love how beautifully she restores old to look new. Awesome feature!